Here’s Cassandra Angelique Bouchard Blair Collins Collins, a poor girl from the mean streets of Martinique. She worked her way up from a menial servant position to become the lady of the manor — twice, in two different centuries — thanks to her charm, her intelligence, her boundless capacity for ruthlessness, and her contract position with the Lord of the Flies. She’s currently living with rich Collins husband #2, and scheming to turn husband #1 back into a vampire. But you can’t just sit around and scheme all day. Here’s what she’s doing with her free time. Last week, Cassandra was kissing lawyer Tony Peterson in the garden, apparently because she couldn’t think of any other way to end the conversation. It’s just something that soap vixens do when they’re finished blackmailing somebody; it’s like a reflex. Unfortunately, Cassandra’s sister-in-law was looking out of the window at the time, and she threatened to tell Roger about his new wife’s indiscretion. So Cassandra — the maddest soap vixen of them all — cast a spell on Elizabeth so that she would think constantly about death. Today, she’s upping the ante, making Liz believe that she’s Naomi Collins, an 18th-century ancestor who committed suicide after learning that her son had become a vampire. This consists mostly of sipping sherry and worrying, which Liz was actually pretty good at anyway. Now, I’m a big fan of lunatic plot contrivances, but this one doesn’t work for me. For one thing, it doesn’t really make logical sense. Cassandra clearly has the power to make Liz simply forget what she saw; she did exactly that with David a month ago. So it’s not clear why she would go to all the trouble of creating a two-pronged curse that apparently requires some preparation and maintenance, just to keep Liz quiet. It seems like a waste of energy. But making logical sense is hardly the point; if that was a requirement, we’d have given up on this show ages ago. The real problem is that this doesn’t make metaphorical sense. There’s no emotional resonance in making Liz think that she’s Naomi. The two characters have nothing to do with each other, except that they were both played by the same actress. There’s no sense in which Liz is Naomi, or ought to be Naomi. So the plot point just kind of sits there, and fills up time. 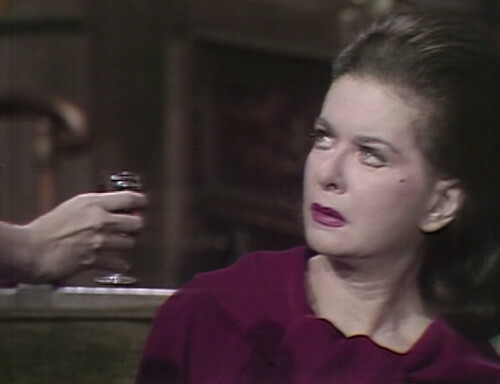 In fact, the only thing that really works about this plotline is that it gives Joan Bennett the opportunity to teach a master class in how to make bewildered acting faces. 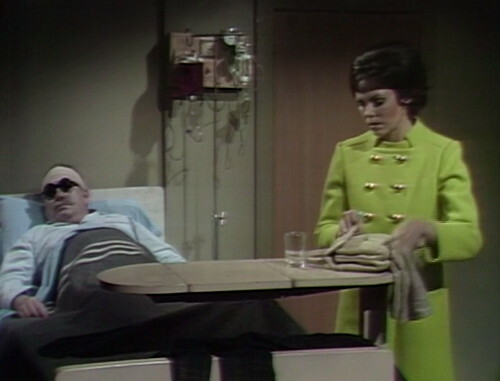 It’s often the case that even in the most dire circumstances, somebody on Dark Shadows is making a special effort to keep the audience entertained. 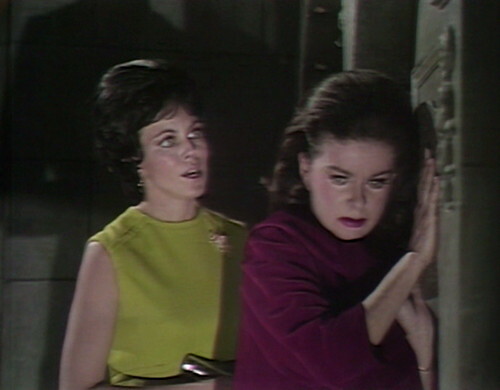 Cassandra takes Liz all the way out to the mausoleum at the Eagle Hill cemetery, just to taunt her some more, and tell her the same thing she said back at Collinwood — she’s Naomi, and she’s going to die. It’s a pretty one-note conversation, which makes me wonder what the drive out to the cemetery was like. In the Missing Adventures fan fiction in my head, they just made small talk the whole way — oh, isn’t that house getting run down, it looks worse every time I see it, but isn’t it a lovely clear night, I thought it would never stop raining, and so on. Then Cassandra pulls the car into a parking space, and takes the keys out of the ignition. “Well,” she says, “here we are.” And then she leads Liz over to the mausoleum entrance, and starts talking about death again. Liz finally decides she’s had enough, and she runs out of the mausoleum. Cassandra laughs and laughs, just completely delighted at achieving something which is frankly pretty pointless. But then it turns out that this was all a set-up — a way to get Cassandra alone in a spooky setting, so they can release the Trask. And, oh, what a relief that is. I don’t think there’s a single boring Reverend Trask scene in the entire canon of Western literature. If you can’t be good, then you should at least be loud, that’s Trask’s philosophy. Trask: You are the witch I have been seeking! And you must be DESTROYED! Cassandra: Go! Return to your grave! Trask: Not until I have DESTROYED you — the only way you can BE destroyed! By FIRE! Look at those eyes, and that smile. He’s an absolute dream. Pure dynamite. Cassandra: No, I command you to return to your grave! Trask: You have no POWER over me! I shall return to my grave only after you have been destroyed. And your DESTRUCTION is at hand! BURN, WITCH! BURN! 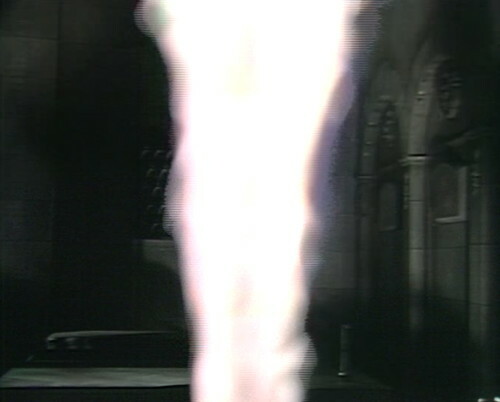 He thrusts his spectral torch in her direction, and then this happens. Oh, it’s gorgeous. It’s exactly what you want to happen to people when they’ve been boring you for ten minutes. It doesn’t work, of course; Cassandra has more death nagging to do. Cassandra: Your flames will not work, Reverend Trask! My power is stronger than yours, and I will summon all the power at my command to put them out! So that works, for some reason, probably because it’s not Friday yet. She puts the flames out, and lives for another day. We’re gonna need a rematch between these two. In Sam’s hospital room, he’s got an array of helpful fluids on the IV stand next to his bed, but he’s not connected to any of them. Also, he’s wearing his sunglasses even when he’s in a coma. Does Trask ever express remorse for persecuting the wrong woman? Whether it was Vicki or the other governess he remembers, he was pretty relentless towards someone he now knows was innocent. If he doesn’t feel bad about that, I’m really not going to feel that bad about his being bricked up. Well, not precisely, but he appears to Vicky to warn her against Angelique. That’s as close an apology as he can manage. And still better than Barnabasa in that respect. I’d argue that Trask had the most vicious, unjustifiable death at Barnabas’s hand aside from Carl Collins. Trask is presented as a “true believer” — not an opportunist and a self-aware charlatan. He’s also right that there’s a witch at Collinwood and the horrible turn of events that the Collins family has experienced is the result of witchcraft. He just has the wrong suspect. And although Nicholas Blair later calls him a “bigot,” Trask doesn’t target Victoria because of her social status or background. She is the most likely suspect. He’s still more a “misguided” DA on LAW & ORDER rather than an outright corrupt one. I think the series itself takes the position that Trask is a fraud because there are no witches and he should know better except… there clearly are, and Angelique manipulated the situation to send Vicki to prison for her own crimes. There’s no evidence that if Trask knew Angelique was the witch, he would have pursued Vicki anyway. But Barnabas bricks him up alive, apparently because that would mirror Vicki’s fate of “dying in prison.” Except Barnabas is even wrong about that — Vicki was hanged and I get the feeling that Trask probably would have preferred that quick death to starvation. Even Forbes — the guy who gaslighted his wife, lied on the stand, and put a hit on a child — got a quick, painless death. I think he’s an opportunist though. Yes, he does believe what he’s doing but he’ll blindly do anything to get his way like coercing Forbes into lying on the stand. And even when he does realize that Vicky is innocent, he does nothing. So perhaps the punishment is a bit harsh (though I was satisfied with how it turned out) but I still Trask is an evil characters. In many ways, I find characters/people who believe what they’re doing is “right” – and use that as justification to hurt others – far more evil than traditional villains. When did Trask realize Vicki was innocent? I don’t recall his gaining conclusive proof. I also admit that I can’t recall offhand if he knew Forbes was lying about Vicki or if he thought the somewhat shady character had been protecting a witch. The latter again is not unlike what the more obsessed DA on a crime drama might do. I can’t remember the exact circumstances – and maybe I’m misremembering – but I’m pretty sure there is a point when Trask realizes Vicky is innocent. But it could be right before Barnabas kills him so he wouldn’t have been able to do anything anyway (or it might have been when Barnabas was tormenting him). Granted, Trask may have chosen to not believe it anyway, because that’s the way he rolled. But this is another thing about the character I find despicable – the fact that he wouldn’t even consider the possibility that Vicky was innocent and there could be another witch. After all, if you’re as experienced in witch hunting as Trask claims to be, wouldn’t you be open to the possibility that a witch might frame someone else? Isn’t that part of their MO? As for Nathan, it can probably be interpreted a couple of ways, but I felt with the dialogue that Trask knew Nathan was stretching the truth with his claims, but didn’t care because he felt the ends justified the means. Well Viki acted like a complete idiot about the entire thing. She knew that witches had been hanged in Salem, even if that was a hundred years prior to where she ended up. She doesn’t keep her head down, she treats Trask and Abigail as if they aren’t worthy of being concerned about. Trask DID consider that there might be a different, or even another witch in the house. He DID suspect Angelique. However, Angelique was NOT an idiot and when she knew she was suspected she played the poor misled innocent who had been tempted by evil but saw the light and returned to God because Trask had purified her. Viki could have done the same thing. Trask and Abigail were not nice people. However, they truly believed there was a witch at Collinwood, and they were right. They just got the wrong person. In any case, not being a nice person does not warrant a death sentence. It does not warrant having a dead prostitute dumped in your room to torment you. If most certainly does not warrant being bricked up behind a wall to die a slow, merciless death. Yes, you’re right about Angelique, I had forgotten about Trask confronting her. Still, him and Abigail are always going on about how deceitful and tricky witches are, yet it never occurs to either of them they might be fooled, because they’re so self-righteous (a big flaw). We can debate whether Trask and Abigail got what they deserved (personally I’m not shedding any tears over them), but I think their crimes go beyond being “not nice.” Joshua is not a “nice” person. Abigail and Trask are deliberately destructive, with no compassion, pity or remorse and willing to sacrifice anyone to get their way. Personally, I think they’re evil, but your mileage may vary. Conversely, Gregory Trask in 1897 deserved his grotesque fate. He killed his wife. He framed someone else for her murder, and then worked with a man he was blackmailing to have his new wife driven out of her mind and sent to an asylum, where he left her to rot. When she returned, he then hired someone to kill her. His fate just felt right. I was glad when Tim Shaw sealed him into Quentin’s room, and I applauded Judith’s ultimate victory over him. More importantly, Trask had inflicted real, true emotional and near physical harm on both Judith and Tim, which karmically justified their extreme vengeance. But 1795 Trask did nothing personally to Barnabas, and unlike Gregory Trask, he was not the victim of an evil smarter power. Angelique framed Vicki with fairly compelling evidence. She also sent Vicki running out of the house into Trask’s arms after his ridiculous ritual. Upon reflection, I think what bugs me about Barnabas’s murder of Trask is that he makes the reverend the victim of his own impotent fury and rage over his current existence. I think he even says as much to Ben that all he has left is his hatred. So, if I hate my life and torture someone who has no real role in why it’s awful, I can’t justify it simply because my victim might not be good person. I think in order for Trask’s death to be more karmic he would have to meet his fate at Vicki/Peter’s hands or have it be more directly linked to his own hubris (eg. he gets torn apart by a mob who discovers he sent innocent girls to their deaths). Now, there’s no way they would have turned Vicki into a killer (or Peter since he’s just as bland as she is). And the second scenario would have probably required more set-up and more screen time away from the main plot. They could have also used Angelique to kill him, that would have been an interesting twist. But ultimately Barnabas makes more sense. Not necessarily because there’s a personal grudge between them – but because it does serve to show the audience how angry and dangerous Barnabas has become. Now, as I’ve mentioned, I was quite pleased with Trask’s end. But, at the same time, I think it’s just as valid to be horrified by what Barnabas does as it shows what a destructive force he can be (and why Joshua ultimately felt his son needed to be put away). Barnabas also killed Abigail for no reason other than that she discovered his secret. There was a moment when he thought he’d kill Joshua for the same reason, but Joshua wouldn’t have it. Same for Dr. Woodard, actually. Barnabas kills a lot of people just to save himself the inconvenience of hiding. There’s a reasonable argument that Barnabas is completely bonkers. Abigail dies because Barnabas chose as his hiding place the house where everyone used to live a few weeks ago. Yes, they’d all moved but it was soon enough that it was like when you still have a few weeks left on the lease at your old apartment and go back there every so often for some final odds and ends. His original “plan” when he is freed in 1967 is to restore The Old House and then kidnap a local girl and hold her hostage there. It’s implied that he truly thinks they’ll live together in undead happiness in the house without anyone finding her. It’s insane. There is an entitled childishness about Barnabas that guides all his actions — both as a human and a vampire. Shooting his uncle in the face is, of course, not the response of a rational adult. Be fair – Abigail dropped dead of a heart attack. Sure, Barnabas probably would have killed her – but I don’t think it’s just because she discovered his secret. There was already animosity between the two, and I think he meant to punish her for all the nastiness she’d been responsible for. After all, he didn’t kill Sarah when she discovered him (although it indirectly lead to her death), or Naomi. At the moment Barnabas knows no other way but to kill people who dont do what he asks or acts like he wants. its an unfortunate sadness about him. But first he’d have to swallow his pride and admit the the poorly educaed Trask knows more than he does, and that his crazy aunt is right. Too much to ask, I think. I think Cassandra torments Liz rather than just removing her memory for the simple reason that she doesn’t like her very much. 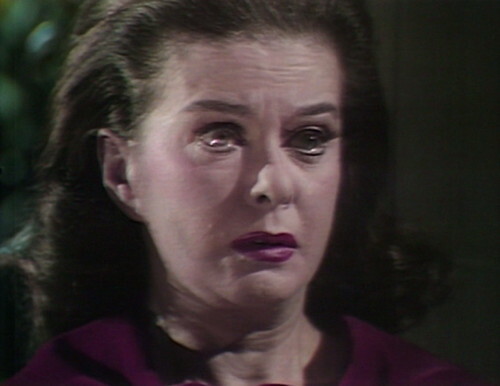 I think Liz has been the most overtly antagonistic to her (other than Barnabas, who fits into her plans). Carolyn dislikes her but has never confronted her. Julia slaps the taste out of her mouth later but she dies too soon after that to make good on any threats (though, it might not be a coincidence that Tom Jennings, who Angelique turned into a vampire, chose Julia as a victim). 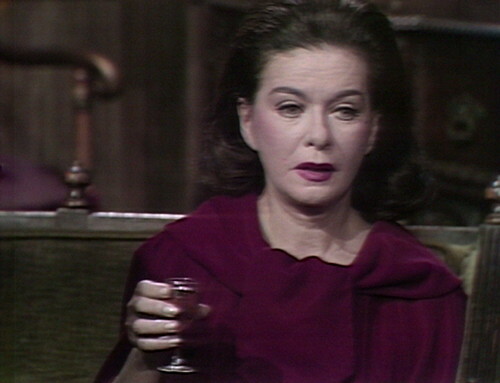 Although there is no emotional connection between Liz and Naomi (the former doesn’t admire the latter as Vicki did Josette), I can see the diabolical motive behind turning the proud, self-possessed mistress of Collinwood into a weak, browbeaten alcoholic. That’s my reading on it. A/C does all kinds of roundabout things that aren’t efficient simply because she likes the irony of something. Liz caught Cassandra kissing Tony and vowed to tell Roger. Plus, in the beginning Liz let Cassandra know she wasn’t happy with her marriage to Roger. She hates anybody who other people love. I thought Naomi was very nice to Angelique when no one else supported her ‘marriage’ to Barnabas. She gave them the Old House as a wedding present. I thought Trask acknowledged that he was wrong with Vicki but never seemed overly concerned that he caused her so much trouble. But Barnabas and Julia are ‘guilt free’ in that regard as well. Both Abigal and Trask were narrowminded zealots, with the singular mission of making sure everybody followed THEIR rules. They were loud, opinionated, and without compassion or empathy, or the ability to acknowledge they were wrong. Like the establishment 1967, or the Republicans of today. The demise of Trask and Abigail was most satisfying. They might not technically have been wrong, but they sure weren’t nice, empathic, forgiving, or any of that Christian doctrine they held so tight. Barnabas showed love, compassion, passion, pain and remorse. He might have gone too far, as any frustrated youth, but I’ll bet the shouts of support from viewers 1967 outweighed the tears for either Trask or Abigal. Neither of who garnered any respect from the other characters in that arc. Sorry kids, im on Team Barnabas. Sorry, Laura, his defense of Vicky was that “there are no witches”. In that he was wrong, and Abigail and Trask were right. They got the wrong person, but they were right. THERE WAS a witch. Barnabas was blind and stubborn, and when he learned the truth, he should hve considere that witch hunters might have some idea of what to do. He was stubborn, and proud, and Trask spoke likne an uneducated man and auntie Abigaul was crazy, and he knew everything. Barnabas’ pride was his own downfall. He finds the withc and what is his solution? Attempted murder which quickly goes south. When he gets legal help for Vicky, he withholds the information as ato who the real witch is. He brought that misery on himself and those around him because of his damned pride. Good points, Laura. What I find interesting is how the “outcasts” within us identify with Barnabas, who is so entrenched (philosophically at least) in the establishment. Adrian has commented on his aristocratic bent, and really, Barnabas’s treatment of Willie, Ben, and Magda was alarmingly offensive. His behavior toward Ben is worse, somewhat, because while that relationship started as purely transactional (“master” and “servant”), Ben’s loyalty was rooted in friendship, which Barnabas never truly respected (or arguably he did, but was too self-involved to return it appropriately). 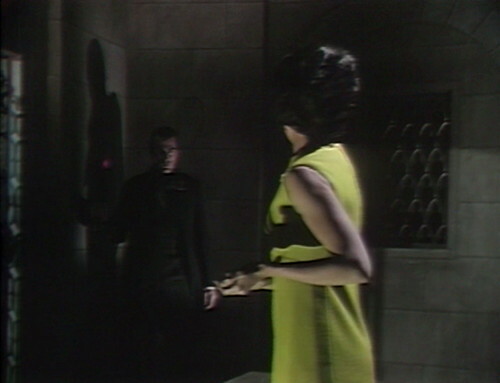 There’s also an argument that Barnabas’s own relationship with Julia was very transactional. He views her as his private doctor/servant and although this somewhat progresses into a sort of intimacy, his goals and interests must always take priority. In fact, he only deduces that Julia is under the influence of Tom Jennings or Judah Zachary because she no longer prioritizes Barnabas above everything else. Adriana, before Angelique, there were no witches in Collinwood. Or any witch hunts for 100 years, and even those are spoken of as a travesty by the folks at Collinwwod.. Abigail and Trask are the boy and girl who cried wolf, or in this case witch.Why would anybody believe them? And nobody did, joshua just placated them, to shut them up. And we have to remember Victoria kept digging her own grave, faster than Naomi could reach for the sherry decanter.And didn’t Barnabas become a Vampire during Vicky s incarceration? Or as his family just dying off, or coming back as zombies courtesy of his unwanted bride. Who he married because she saved Saras life. Stephen, I think we love, or at least I love Barnabas because he is not only tragic hero, but perhaps the quintessential Bad Boy. Yes he may be selfish, but aren’t we all? This is the reason tony soprano, heathcliff, the breaking bad guy, don draper, luke from general hospital, and quentin resonate so deeply. Barnabas asked joshua to save vicky, before he, his own father staked him. If that isnt thinking about others, I don’t know what is. Stephen, Barnabas is correct, those are the only times Julia doesn’t put Barnabas first. It isn’t his fault Julia is in love with him. Its her choice. And there are times he makes it clear Julia is very important to him. 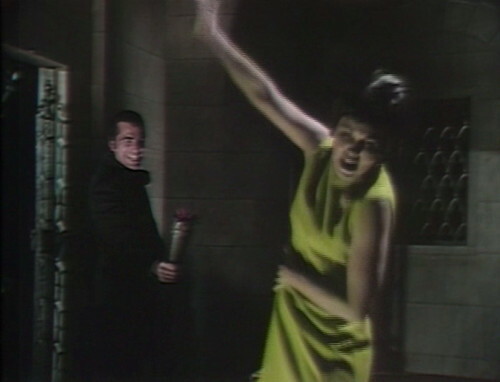 And thanks to the Epilogue show, after DS was so rudley cancelled, we know Barnabas does finally fall for Julia. And may I just say, I love this group. Ib learn so much and I value everyone’s insight. Its a true pleasure. Yes, yes… there were no witches for a long time. But once Barnabas KNEW that there was a witch and that he was married to her, he chose the worst possible way to handle it. It migh have him thinking that maybe Aunt Abigail knew what she was talking about. And that Trask might know a thing or two. But, he was a Collins, the heir to the fortune, and Trask an uneducated backwoods preacher. Barnabas was very much the aristo (sometimes he makes me want to sing the Ca ira, which promises to hang the aristos from the lampposts). In 1967 he is bemused why Maggie would want to be just a serving girl instead of an aristocrat like Josette. He was offering her a step up, and the ungrateful wench rejected it. Yeah, we all like bad boys, but that does not mean that we attribute to them virtues that they do not have. Adriana, I do not see the snobbery you attribute to Barnabas. Or the sense of entitlement . I see those in Joshua and later Roger. Barnabas was the enlightened one, teaching Ben to read, excepting Victoria into the house hold, urging Joshua for Bens freedom. I have to go back and watch the episodes to see if I can see what you see. Barnabas is, perhaps ironically, more progressive in the 18th century than he is in the 20th, where he is openly sexist and classist. This trait continues in 1897 with his clear bigotry regarding gypsies. I’d argue that his treatment of Ben and Willie is like a pet owner. He might be nice on occasion but he never treats them like equals, especially Willie. Also the one more small item of Barnabas forcing Jeremiah into a duel to the death as his first reaction to the new of their marriage – nevermind that Barnabas himself was dallying with the hired help under the same roof just prior to these events – how dare Josette reject him – well, he’ll take care of that problem.. Absolutely, Joanne. For all Barnabas knows, Josette really did fall in love with Jeremiah, and his response is to murder him. This demonstrates that he’s incapable of recognizing her own feelings of putting her ahead of his own desires. She is a possession. This is the moment when he reveals how much like Angelique he is. Yes – Barnabas and Angelique would have been much better suited to be together – they could keep themselves happy by constantly trying to ‘one up’ each other.. The reason Cassandra/Angelique makes Liz think she’s Naomi? Probably the same reason Cassandra’s portrait made Roger momentarily think he was Joshua. Because Barnabas is the heart of the show, the 1795 storyline is its soul, since it explains what Barnabas became and what he represents. They will refer again to this period at the end of 1897 when Barnabas actually returns there, and again in 1840 where some of the characters emerged from the 1795 period. The writers will take every opportunity to refer to 1795, to remind the audience of the storyline that has become the show’s essential background. Its true, barnabas was born a man, we see with compassion, at least for his era,and then turned into a monster literally. He is put under spell. Jeremiah is put under a spell and marries his nephews fiance. Somehow Jeremiah s transgressions are forgivable. Plus Jeremiah didn’t have to show up at the duel. And Steven, barnabas does treat Willie like a dog, but this was before the writers realized Jonathan Frid was the savior of the show. Willie was a creep, Later to become ethel to barnabas and julias Lucy. Yes, but the real Naomi would not think the Countess was plotting with Joshua against her about Barnabas since I believe the Countess Natalie actually liked Naomi. Also, Joshua would found a picture of Angelique very beautiful. Liz and Roger thought sometimes they were Naomi or Joshua but it wasn’t ke what actually happen. I’m sure it’s come up before, but (in spite of being the kind of bad planner he is) why did Barnabas not threaten Trask into retracting everything IN PERSON? How did he think a note left behind by a Trask who “disappeared” wouldn’t have a lot more trouble convincing people? Of course, forgetting that reason, a discredited Trask might have been an even better revenge than a Trask walled up alive. Hooray, Vicki’s back – and she’s brought the Dream Curse with her! I like that Sam keeps his glasses on while comatose; I admire his Jeff Winger-esque dedication to cool. But I’m confused about the dream – can Dream Curse Sam see? Can he, in fact, see better than pre-blindness Sam, since he can perceive all those horrors in a dingy half-lit smoke-filled room through his sunglasses? Is that moustache even real? 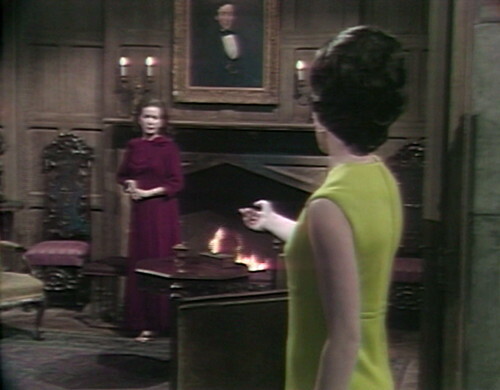 NVM; I’m sure all these questions – and more – will be answered in the next episode of… Dark Shadows. When Casandra tells the reverend that his flames will not work she calls him REVEREND BRAND, not Reverend Trask. Sorry, Pieces, but do you, by any chance, have closed captioning? I do, and I could’ve sworn the captions said Reverend Bland or maybe Brand, but I still have OK hearing, and I rewound and played it again, and the second time I thought she said “Reverend Trask” though admittedly I’m not 100 % clear. I have been noticing terrible mistakes by the caption people. They get words wrong all the time. For example, when Tony brought that ankh to Prof. Stokes, the two men kept calling it a “Coptic cross,” but the captioner kept writing “Celtic cross.” At one point I went into the next room and even with my poor hearing I could hear Stokes clearly say “Coptic” and yet the captioner put down what she/he thought made sense instead of what he/she was actually hearing. Even more annoying is when they can’t get the character names right. I think I first commented about this during the Phoenix storyline when the captioner kept attributing Laura’s dialogue to “Angelique.” I thought “Honey, you’ve got the wrong storyline on your brain.” More recently, when Adam kidnapped Carolyn, the captioner kept calling her “Amanda.” I had to look it up, I had forgotten that in a future (I mean past) storyline Nancy plays a character named Amanda. So to make a long story short, don’t rely on the captions as if they were gospel. And, of course, I haven’t even established that you have them. I must not have commented about the Phoenix storyline here since it is not covered by Danny. Must have pointed that out in some other forum.